This work is devoted to the issues of processing holes in different thickness of tubular billets great length deforming broaching. The urgency of this problem is substantiated. The results of studying the regularities of deformation of a material in the deformation zone under deforming broaching are presented. The reasons for the formation of this type of geometric error as the curvature of the axis of the machined hole are established. They are caused by the variation of axial deformations of the sections of blanks of various thickness in the circumferential direction. An analytical-experimental model for determining the curvature of the axis of processed products is given. The factors influencing this kind of error are systematized. The main structural factors of the deforming broach are identified, which can influence this kind of error. Experimental studies were carried out to optimize the design parameters of the instrument. An experimental mathematical model is developed to determine the influence of the main constructive factors of the instrument on the change of this type of error. The conditions for minimizing the curvature of the axis of the machined hole are established. The influence of the conditions of basing the workpiece on the curvature of its axis is determined. The recommendations on the design of deforming broaches have been developed, which make it possible to ensure the alignment of the workpiece and the tool. New designs of deforming broaches have been developed, which make it possible to control the cylindricality of the treated deep holes. The results of experimental verification of the deforming broach designs developed during the processing of a pilot batch of various thickness blanks are presented. A.M. Rozenberh, O.A. Rozenberh, E.Y. Hrytsenko, and E.K. Posvyatenko, Kachestvo poverkhnosty, obrabotannoy deformyruyushchym protyahyvanyem [Quality of the surface treated by deforming broaching]. Кyiv, Ukraine: Naukova Dumka Publ., 1977, 188 p. [in Russian]. Yu. A. Tsekhanov, and S.E. Sheikin, Mekhanika formoobrazovaniya zagotovok pri deformiruyushchem protyagivanii [Mechanics of workpiece shape-generating at deforming broaching]. Voronezh, Russia: Voronezh State Technological Academy, 2001, 200 p. [in Russian]. Yu.G. Proskuryakov, V.N. Romanov, and A.N. Isaev, Ob’emnoe dornovanie otverstiy [Volumetric turfing of holes]. Moscow, Russia: Mashinostroenie Publ., 1984, 223 p. [in Russian]. A.M. Rozenberg, O.A. Rozenberg, and D.A. Sirota, Tverdosplavnye protyazhki dlya obrabotki otverstiy metodom plasticheskogo deformirovaniya [Hard alloy metal broaching for forming with plastic deformation]. Кyiv, Ukraine: UkrNIITI, 1968, 40 p. [in Russian]. O.A. Rozenberg, Mekhanika vzaimodeystviya instrumenta s izdeliem pri deformiruyushchem protyagivanii [Mechanics of interaction between the tool and the product at deforming broaching]. Кyiv, Ukraine: Naukova Dumka Publ., 1981, 288 p. [in Russian]. Ya.B. Nemirovskyi, “Naukovi osnovy zabezpechenya tochnosti pri deformuyuchomu protyaguvanni” [“Scientific principles ensure accuracy when deforming broaching”]. Sc.D. dissertation, National Technical University of Ukraine “Igor Sikorsky Kyiv Polytechnic Institute”, Kyiv, Ukraine, 2018. [in Ukrainian]. Yu.A. Tsekhanov, Ya.B. Nemirovsky, “Vliyanie tehnologicheskih parametrov deformiruyuschego protyagivaniya na konechnie deformacii zagotovok” [“Influence of the technological parameters of the deforming broaching on the final deformation of blanks”]. in High technologies in mechanical engineering. Kharkiv, Ukraine: Kharkiv State Polytechnical University, 2000, pp. 281-285. [in Russian]. Ya.B. Nemirovskyi, A.I. Gerovsky, “Krivizna osi raznotolschinnih zagotovok obrabotannih deformiruyuschim protyagivaniem” [“The curvature of the axis of different thickness blanks processed by deforming broaching”], Tekhnika v silskohospodarskomu vyrobnytstvi, haluzeve mashynobuduvannia, avtomatyzatsiia [Engineering in agricultural production, branch engineering, automation], no.14, pp. 222-229, 2004. [in Russian]. Ya.B. Nemirovskyi, “Tehnologicheskoe obespechenie tochnosti pri obrabotke otverstii deformiruyuschim protyagivaniem” [“Technological provision of precision in the treatment of holes by deforming broaching”], Rezanie i instrument v tekhnologicheskikh sistemakh [Cutting and the tool in technological systems], vol. 83, pp. 195-207, 2013. [in Russian]. F.S. Novik, Matematicheskie metody planirovaniya v metallovedenii [Mathematical methods of planning in metallurgy]. Moscow, Russia: Moscow Institute of Steel and Alloys, 1972, 106 p. [in Russian]. Ya.B.Nemirovskyi, etc. “Zbirna deformuyucha protyazhka” [“Collected deforming broach”], UA Patent 124157, March 26, 2017. [in Ukrainian]. Ya. Nemyrovskyi , E. Posvyatenko, S. Sheikin, Yu. 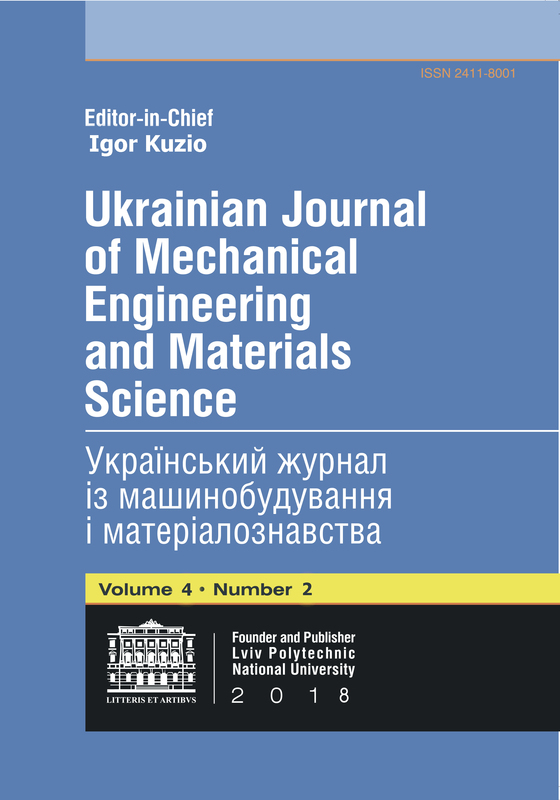 Tsekhanov , "Dynamics of two-mass mobile vibratory robot with electromagnetic drive and vibro-impact operation mode", Ukrainian Journal of Mechanical Engineering and Materials Science, vol. 4, no. 2, pp. 14-25, 2018.